This morning, a report in the New York Times shed more light on Jeffrey T. Johnson, the man authorities say shot and killed his former boss near the Empire State Building Friday before he was gunned down by police. Nine others were injured by police bullets. The newspaper reported Johnson was a "meticulous artist" who worked as a designer at his company, Hazan Imports, which sold belts and handbags — until he was laid off nearly two years ago. But in his spare time, Johnson ran a website with galleries full of illustrations of cars. Most of them are fairly standard car portraits, but many veer into the strange. A childhood love of comic books seems to have forged his career. 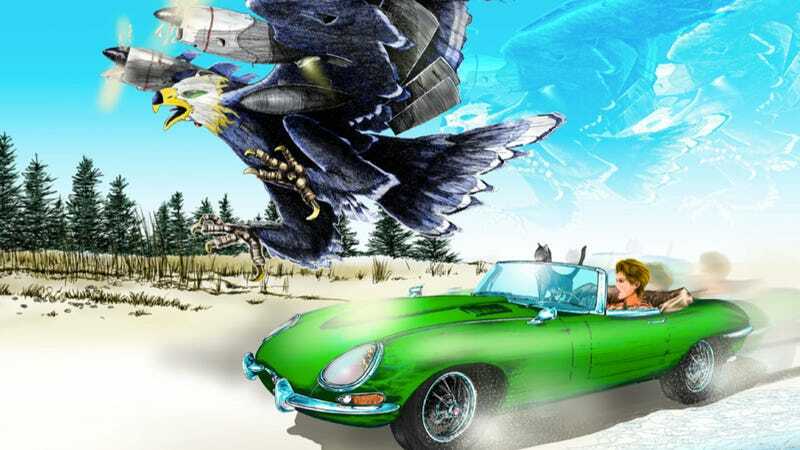 He had returned to the form in recent months, posting intricate illustrations of cars on a Web site he ran, stjollysart.com, as a way to make money selling T-shirts. "This gallery of illustrations," he wrote in a caption beneath his rendering of a muscle car, "is an homage to all the great art and artists featured in all the automotive comics my friends and I pored over as kids during the '60s." Searching around Johnson's site reveals illustrations mostly of classic American muscle cars and some old-school Porsches and Ferraris. The cars themselves show a great attention to detail, although his drawings of people or other objects tend to show some unusual proportions. "This guy was very eccentric," the co-worker said. "He was so detail-oriented. If he had a free minute, he would start doing origami. The things that came out of his mind were so original and creative, you knew that his mind didn't work the same way as normal people. But you worked with the guy so long, that you just chalked it up to Jeff being Jeff." He seems to have spent more time drawing women than dating them. A series of six illustrations of an attractive woman on a motorcycle, on his Web site, describe a chance encounter in Florida in 1983, at a gas station. "Her blonde tresses fell just below the taut line of her shoulders and was being teased by a sea breeze coming off the bay," Mr. Johnson wrote. He told her, "Nice bike," and she replied, "in a soft, throaty voice, ‘Fast bike.' "
Overall though, searching through Johnson's site uncovers no indications that he was a man on the verge of snapping and taking someone else's life. As with all of the public shootings we have seen this summer, it's a sad and unfortunate incident that leaves more questions than answers.